I write these words from Vietnam, where Amy and I are on vacation for the next few days. We’re spending some time in Hanoi and Siem Reap, Cambodia. Hanoi is a hectic and crowded city, with countless motorcycles that make crossing the street a treacherous experience. It is a combination of the old and the new, a place that wants to hold onto its traditions and experience the pleasures and benefits of a modern society as well. 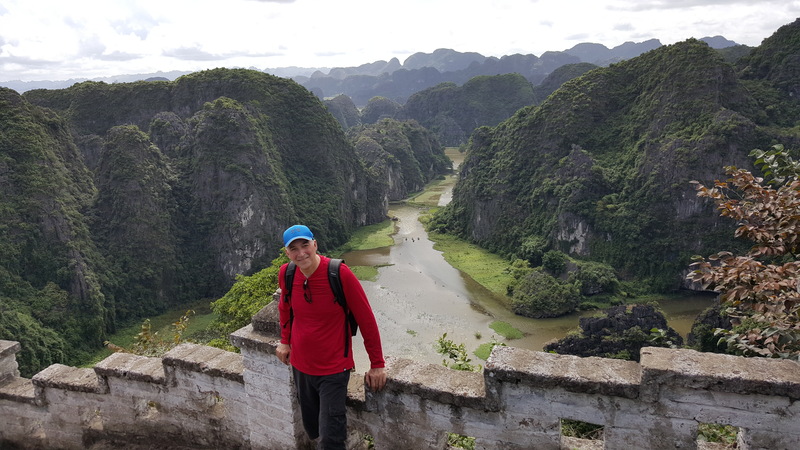 Our first day in Vietnam was spent in Ninh Binh, a locaton about two hours outside of the city that offers hiking, cycling and boating to explore the stalactite caves at the end of one of many canals. I climbed “Lying Dragon Mountain,” nearly 1,000 feet and countless steps similar to the climb up Masada, the reward for which was not only a remarkable view but the feeling of accomplishment as well (that’s where this photo was taken!). We were joined on this trip by two younger couples, both in their 20s, one from Poland and the other from Germany. Amy and I introduced ourselves and said what our professions are; I never hesitate to say that I am a rabbi even to those who likely know little if anything about Judaism, though I sometimes have to describe myself as a “Jewish Priest” to those for whom English is not a first language. Not one word was expressed nor one question raised by our trip companions about the relationship between the two countries from which they’re from and the subjugation and slaughter of the Jewish people. Could it be that the topic is unimportant or irrelevant to them? Or have their generation dealt with the horrific nature of what their parents and grandparents did and didn’t do to save a people? Also of interest was the young Vietnamese woman who owns and operates “Ethnic Adventures,” the travel company we used to plan the day’s itinerary. I had a chance to ask her if she had any feelings about Americans because of a costly and destructive war. She seemed virtually uninterested in the topic, answering that older people might remember, but her generation just wants to move on. I resisted telling her that yesterday was Veterans’ Day in the United States, a day on which we not only remember fallen heroes but also on which quite a few people of all ages feel the sting of war and its sacrifices. Should we separate ourselves from the darkness of the past? The Jewish answer is that we always allow ourselves to remember, even when our memories are painful, for it is not really possible to remember selectively. I look forward to discussing these reflections and other experiences with you when I return in a few days. In the meantime, please make it a point to be at Oheb Shalom for a special evening next Friday, November 20. The Shabbatones, the Jewish singing group from the University of Pennsylvania, will be with us for all of Shabbat. They are one of the nation’s premier Jewish a capella groups (they were invited to sing for President Obama at the White House Chanukkah party last year!). Next Friday night will begin with Kabbalat Shabbat at 6:15 (during which the Shabbatones will sing), a delicious Shabbat dinner at 7:00 PM, and a concert at 8:00 PM. Please try to be with us for the entire evening, but it’s perfectly fine to come only to the concert. And…the Shabbatones will hold a “Beat Box” workshop for Oheb Shalom’s kids on Saturday morning, and then will perform with our kids to end Shabbat services. Don’t miss the fun! This entry was posted in Cyber Letter and tagged travel, vietnam. Bookmark the permalink.